Cozy room comfortably accommodates one or two guests. Pleasant interior in dark beige colors, custom functional furniture allows you to feel comfortable whether on a business or vacation. Work and sleep areas are successfully organized on the area of 25 sq m. Room offers an ergonomic work desk, phone, satellite Full HD 32 "TV, high-speed Wi-Fi. Double standard is equipped with a queen bed (160 * 200 cm), modern air conditioning, a digital safe, a mini-bar, tea & coffee making facilities. TV LED LCD Full HD 32 "
One cozy room of 25 sq m with the views of the city is suited for a comfortable double accommodation with all the benefits of a five star service. Pleasant interior in dark beige colors, elegant and functional furniture will give you a feeling of comfort and care. Room is optimally suited for business travelers who are accustomed to first-class quality of service. 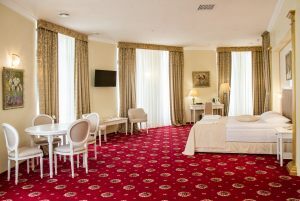 Room features a comfortable work area with a telephone, Full HD 32 "TV with satellite channels, high-speed Wi-Fi. Double Standard Room is equipped with two single beds (90 * 200 cm), modern air conditioning, a digital safe, a mini-bar, tea & coffee making facilities. Bright, spacious room with average area of 30 sq m, with windows offering views of pine park or the city. Great choice for a comfortable single or double accommodation. Individually designed interior in dark beige colors, selected designer style furniture, just to create relaxing atmosphere. Room is zoned into work and sleep areas. Work area features a functional work desk, seating area, telephone, satellite Full HD 32 "TV, high-speed Wi-Fi. In addition to the queen bed there is a comfortable sofa that can be used as an extra bed for a third person. Spacious room with an average area of 36 sq m is designed for single or double occupancy. You can enjoy beautiful views of the park area and summer pool with terrace. Stylish interior of the room is made in bright colors. 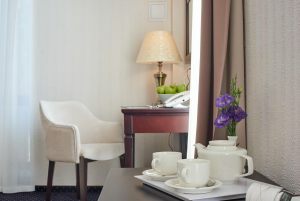 Combined with cozy furniture it allows our guests to feel comfortable during a business trip a vacation at our hotel. 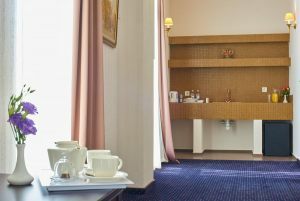 Room provides a business area with a functional work desk, seating area, a telephone, satellite Full HD 32 "TV, high-speed Wi-Fi, tea & coffee making facilities. In addition to the queen bed there is a comfortable sofa that can be used as an extra bed for 1 or 2 extra persons. All Studio Rooms have a small functional kitchen area, elegantly decorated with gold mosaics with the hint of medieval aristocratic style. Very spacious room with the area of 60 sq m with panoramic windows and double-glazed windows with improved sound isolation, a terrace and scenic views of the park area and summer swimming pool. Panoramic windows, combined with the elegant interior and the exclusive designer furniture create a feeling of spaciousness, comfort and privacy. For your convenience, the room has business area equipped with full functional work desk, seating area, telephone, satellite Full HD 32 "TV, high-speed Wi-Fi, tea & coffee making facilities. Room has a large queen bed and a comfortable sofa that can be transformed into a double bed for your children or friends, and a terrace with luxury rattan furniture for relaxing. 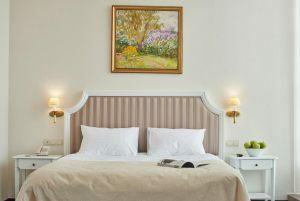 Great spacious room of 45 sq m with nice views of the pine park, summer swimming pool or the city. Large windows let in plenty of sunshine and are equipped with black out curtains. UPVC windows are totally soundproof. For your convenience, the room is equipped with full functional work desk, seating area, telephone, satellite Full HD 32 "TV, high-speed Wi-Fi, tea & coffee making facilities. Room has a queen size bed with a comfortable mattress and a cozy sofa that can be transformed into a double bed for your children or friends. 1 or 2 TV LED LCD Full HD 32 "
A premium room of 60 sq m has panoramic views of the pine park by the hotel and an outdoor pool with sun terrace. 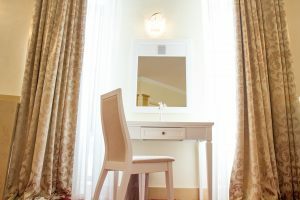 Elegant interior design in beige and gold tones, marble coverings and fashionable white furniture helps to create an aristocratic atmosphere and exclusivness for our dear guests. Suite rooms are equipped with a large queen bed, and a sofa that can be transformed into a double bed for your children or friends. 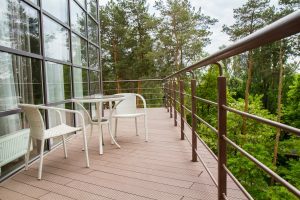 Rooms have a terrace with stylish wicker furniture. 2 TVs LED LCD Full HD 40 "
Exclusive two-room apartment of 70 sq m with a truly luxurious interior of selected white furniture and amazing panoramic view of the park area and the city. 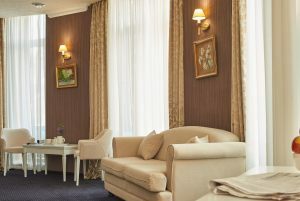 The luxurious interior of the room is made in beige and gold tones. And with sunshine coming through large windows it creates romantic mood and sense of celebration. The room for newlyweds has a queen size bed and snow white linens. An original design decision is a big bathtub in the bedroom. TV LED LCD Full HD 40 "
Superior two-room apartment of 70 sq m with panoramic views of the park area and summer terrace with outdoor pool. Windows are double-glazed and soundproof, so that nothing disturbs your rest. 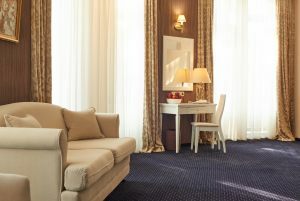 Warm beige interior tones complemented by designer furniture create a feeling of premium comfort for our guests. 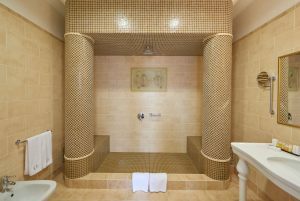 Room’s gem is a huge bathroom made with marble and stucco. Guest room features a sofa, armchairs, and a queen size bed in the bedroom. Early check in / late check-out - 50% of the room rate per night. Accommodation of children under 6 years old with their parents in the same room without extra bed - free of charge. Children aged 6 to 12 years with extra bed - 200 UAH / per night, breakfast included. Children aged 12 years with extra bed - 400 UAH / per night, breakfast included. Cots available free of charge for children up to 6 years.